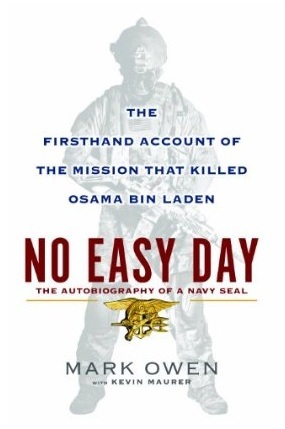 While No Easy Day is subtitled The Firsthand Account of the Mission that Killed Osama bin Laden, it certainly covers more than that. Mark Owen’s real name is Matt Bissonnette. So far most of the reviews I have read focus on a small selection of beliefs. Either that this book is courageous or makes the SEAL a coward for breaking an oath. I shrug off both of those ideas simply because, while this book may be political in nature, I don’t view it that way. We live in the Information Age and this book gives us information. The first half of this memoir focuses on the author’s early stages of his SEAL career. It was easy enough to follow and interesting to see what it takes to do what soldiers do. However, it lacked the type of depth I was looking for. Bissonnette teamed with Kevin Maurer, a journalist who covers special forces, to write this book, yet it seemed like a transcription of the SEAL telling his story to someone orally. Did I expect flowing passages with transcending imagery? No. But I expected more heart. Then there were the times when he tried to detail the emotion of a moment and ended up explaining what he orders at Taco Bell. Regardless of the lack of what makes a book a traditionally good read, the book fed my appetite for information. The raid on Osama bin Laden was thoroughly detailed and painted the clearest picture yet. It did tell the real story. Again, it read like a Wikipedia article instead of a book, but this will be the basis for a lot of work to come out in the future. No Easy Day is worth picking up if you crave information. Expect to divulge it quickly, but don’t expect to be blown away. The amount of information isn’t too much to take in. Most of it is a fleeting thought that you won’t have to remember. There isn’t much depth, but this book didn’t need it. If you strictly want to read about the raid, skip to the ninth chapter. If you actually do so, you’ll miss out on the relationships Bissonnette built over his early years as a SEAL. A lot of the same names from his first days at Green Team are present on Operation Neptune Spear. The only nagging thing that I feel I need to write about is the writer’s personal views inserted near the end. He did such a great job avoiding politics, but then there are jabs at President Obama. While I’m sure countless servicemen would rather McCain have won in 2008 and want Romney to win in this upcoming election, it felt alienating for Bissonnette to suddenly include personal beliefs at such a late phase in the book. I applaud anyone who can articulate why they do or do not support a politician, but somehow the comments seemed too spiteful for the rest of the book. It was an interesting read overall that set a lot of rumor straight, but also opened a lot of doors. For as much as it gave me, I wanted more as I turned every page. It wasn’t a bad book by any means. In fact, it did what I think Bissonnette wanted the book to do. I now want to know more of the facts. As many as I can get my hands on. He enlightened the world on as much of the truth as he could have. Now it’s just a waiting game until more details are revealed.